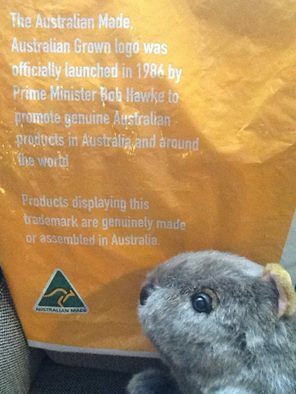 A carrier bag advertising the Australian Made, Australian Grown logo, together with Bruce, an Australian made toy wombat. Photograph by author. October 2015. Wherever I travel in the world, I make the effort to buy locally made souvenirs and support local people. At the very least I make sure I buy a gift that is actually made in the country I am visiting. This entry was posted in Buy British, Gifts and tagged Australia Made, British Family, British Made, British Manufactured, Buford Woodcraft, Buy British, Custom Works, DreamGB, Fly the Flag, From Britain with Love, GBE, Gifts, Great British Furniture, Grown in Britain, I'm Backing Britain, Jail Dornoch, London Transport Museum, Made in Britain, Made in England, Made in Northern Ireland, Made in Scotland, Made in the British Isles, Made in the UK, Made in the United Kingdom, Made in these Isles, Made in UK, Made in Wales, Make The Most Of, Manufactured in Britain, Manufactured in the UK, National Trust, Pickle, Purely Australian, Souvenirs, the British Isles, The Great British Exchange, Things British, UK, UK Made, ukmade, Victoria Eggs on October 10, 2015 by ukmade. In response to this question I saw on trip advisor – where is the “Best place for affordable souvenirs made in England”? Wherever you travel in the world, please make the effort to buy locally made souvenirs and support local people. At the very least make sure you buy a gift that is actually made in the country you are visiting. This entry was posted in Buy British, Gifts and tagged Aerende, Buford Woodcraft, Custom Works, DreamGB, From Britain with Love, Gifts, Handmade GB, Jail Dornoch, Made Closer, Made in these Isles, Make The Most Of, Not on the High Street, Pickle, Souvenirs, The Great British Exchange, The Great British Home, Things British, trip advisor, UK, Union Flag, Victoria Eggs on October 20, 2014 by ukmade.